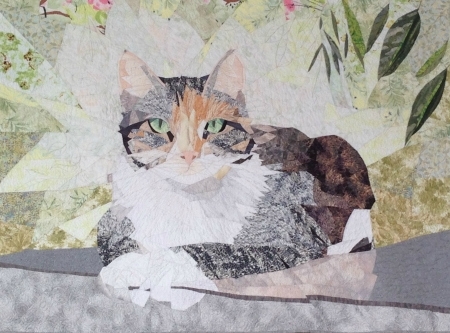 Starting with your own sharp photo of a pet, flower, or landscape, I'll teach you how to make a pattern for quilt that is uniquely yours. Through discussion of each student's project, we'll touch on perspective, level of detail needed to communicate an image, what needs to be included in the pattern and what may be added later through fabric selection or with quilting, embroidery, pens, or paint. At the end of the day, we will discuss how to use the pattern to make a quilt. NOTE: Students who complete a pattern in this class may wish to take Betsy’s workshop "Piecing a Picture Quilt". Please send me (betsy@betsyhabich.com) your photo before class! - 8 1/2” x 11” sharp color photo of your subject (a pet, a flower, or landscape; this technique is not suitable for human faces). - Masking tape or blue painters’ tape. About the Instructor: Betsy Habich has had several of her picture-quilts juried into the IQA/Houston and AQS/Paducah Shows, the Machine Quilters Expo (MQX), and Quilters Gathering. Her work has been awarded yellow and red ribbons at the Vermont Quilt Festival, a blue ribbon in Color Compatibility at The Gathering, a Teachers Choice Award at MQX, as well as a 1st at the Northeast Quilt Festival. In addition, she has had several one-woman shows at local quilt shows, shops, and libraries. She is a self-confessed fabricaholic and cat person, though she has also been known to play with dogs!